Allermuir was constructed in 1879 for the personal use of Sir Robert Rowand Anderson, who designed the Scottish National Portrait Gallery. 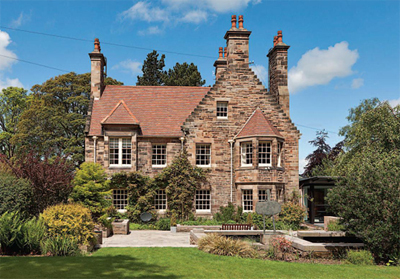 The house is listed Grade A and built of red sandstone with crow-stepped gables and tall chimneys under rosemary tiled roofs while the interior has a wealth of Columbian pine paneling and delicate plasterwork. Extended in 2008 to create a contemporary family living kitchen and living area overlooking the garden. Family accommodation lies over three floors with a fine blend of formal receptions rooms, comfortable bedrooms and the new open-plan kitchen/living area. The house comprises reception hall, four reception rooms including a large study and a notable drawing room. There are six bedrooms over two floors, two cloakrooms and four bathrooms. The rooms are laid out in a very flexible way. Outside is the wonderful south-facing garden which amounts to nearly an acre while a sheltered terrace fronts the kitchen/living room. The landscaped garden area comes with a water feature, while the front garden is more traditional, with extensive lawns and colourful borders. Allemuir is located in Colinton in Edinburgh, where nearby shopping is available at Colinton village, on the Water of Leith, which offers excellent shopping and restaurants. The city centre is close by for High Street amenities, galleries and museums. The guide price is £2.2m. For further information please contact Savills on 0131 247 3700 or visit .